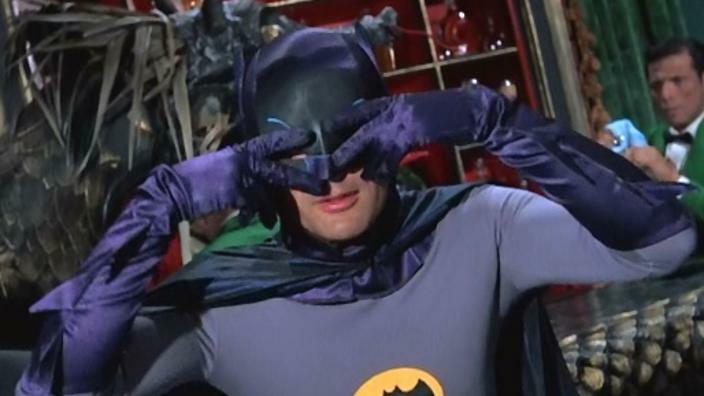 The birth of Batmania — and the Batusi! In celebration of Detective Comics #1000 and Batman’s 80th anniversary this month, we’re counting down the 13 GREATEST BATMAN STORIES EVER — from all media — as selected by a panel of 16 experts, including such luminaries as former DC publisher Paul Levitz, legendary Batman artist Neal Adams and Batman: The Brave and the Bold producer James Tucker. For a complete rundown of how the vote was conducted and the full list of panelists, click here. 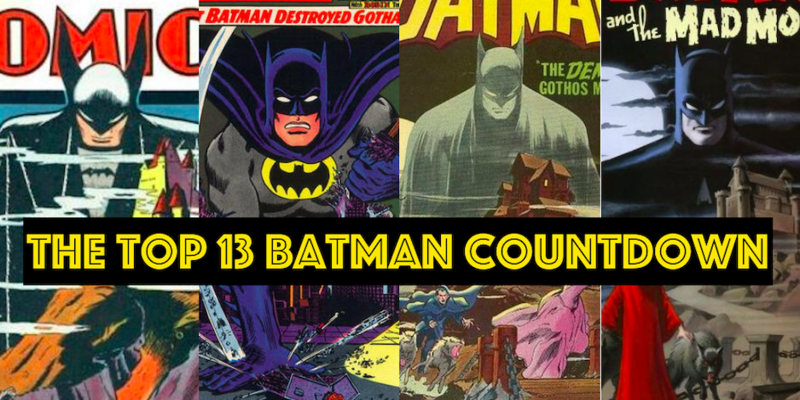 The countdown will run daily across 13 days and culminate in THE ULTIMATE BATMAN READING AND VIEWING GUIDE, which will feature every single Batman story cited by our panel. 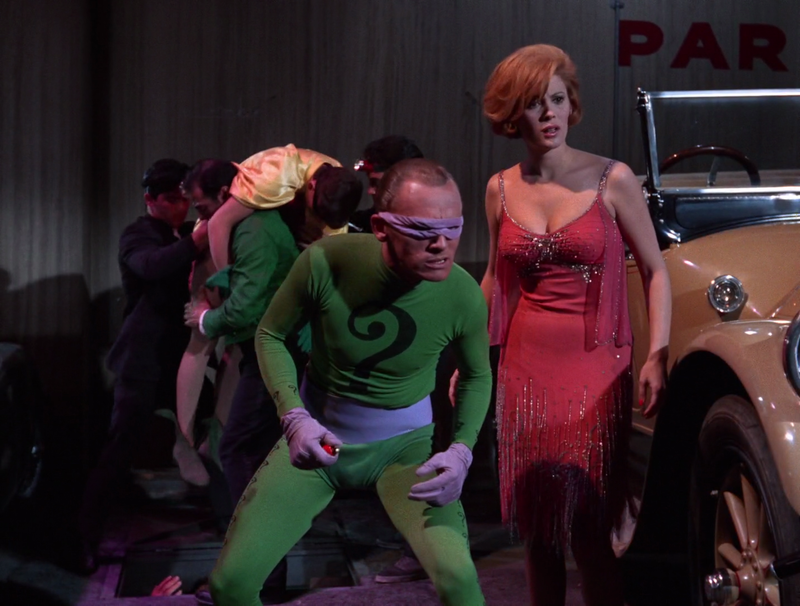 Frank Gorshin as the Riddler and Jill St. John as Molly. Written by Lorenzo Semple Jr. Directed by Robert Butler. The debut two-parter of the classic Batman TV show is frequently considered the best episode of the series — an entry that established the series’ tone when it was at its best: campy without being too broad, with healthy helpings of stylish action and adventure. Adam West and Burt Ward immediately conveyed an easy rapport and brought to the small screen an enduring vision of the Dynamic Duo. Much has been written and said — both here and elsewhere — about the world created by producer William Dozier and top scripter Lorenzo Semple Jr. But it’s always worth pointing out the enormous impact made by the show’s first Special Guest Villain: Frank Gorshin as the Riddler. Before Jan. 12, 1966, the Riddler was a relatively obscure bad guy who had only recently returned to comics. (He was resurrected in 1965’s Batman #171 after a mere two appearances in 1948.) But Gorshin’s performance was so electrifying, the Prince of Puzzlers vaulted to the Rogues Gallery A-List, making him not just a comic-book mainstay but a popular villain in merchandising, video games and the modern screen. The birth of the Batusi! I wish all of the episodes had been this good. Imagine if season 3 had maintained just half of this episode ‘s effort/quality. This was such a great episode! I agree with everything that has been said about it! Two Batman ’66 stories on the countdown! Best. Riddle. Ever: There are FOUR men in a boat with THREE cigarettes and NO matches. How do they smoke? Simple. They throw one cigarette off the boat and make the boat a “cigarette lighter”!